New in CSS4 Color: ICC profiles! CIE Lab! Rendering Intents! OK by new I mean the stuff that used to be in SVG2. Which used to be in SVG Print. Which used to be in (well you get the idea). Why has color management taken so long to get going on the Web? Isn't it kind of esoteric and specialized - what does it do for you, in practical terms? What, in fact, is color anyway - isn't it kind of subjective? After attending this talk you will understand that color is a measurable, reproducible sensation; standardized since 1931! You will get white point adaptation (you already know this, you maybe just don't know the term). You will understand Lab color space, be comfortable with gamut volume plots, and be able to laugh at snake-oil claims about color gamut coverage in advertising. You will be really looking forward to seeing CSS4 Color implemented in all the browsers (and the HTML/CSS to PDF converters). And just maybe, you will be kinda pissed we had to wait this long to get what print media has taken for granted for decades, now. 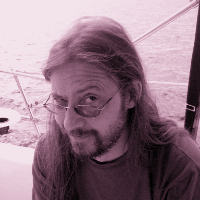 Chris Lilley is a Technical Director at the World Wide Web Consortium (W3C). Considered “the father of SVG”, he also co-authored PNG, was co-editor of CSS2, chaired the group that developed @font-face, and co-developed WOFF. For three years he was a member of the W3C Technical Architecture Group. Co-editor of CSS3 Color and CSS4 Color, Chris is still trying to get Color Management on the Web, sigh. Currently working on CSS levels 3/4/5 (no, really), Web Audio, and WOFF2.